There is a wonderful French proverb saying: ‘Il vaut mieux un petit chez soi, qu’un grand chez les autres.’ It means basically: There’s no place like (our own small) home. Particularly true in my case when I think of my shoebox sized apartment. But creating a personal, warm and comfy home is not a matter of size – with a few tricks and tweaks every home can have that personal touch. As I mentioned yesterday, I am currently enrolled in an interior styling online class taught by the impeccable Queen of the Jungalow, Justina Blakeney. Styling the own place (or any other home) can sometimes be really tricky. So I’ve decided to take the course and learn something from the experienced pro. And it proved to be very helpful. After a short theoretical introduction embracing the ‘8 principles of styling’ we were quickly asked to embark on our very own interior styling adventure. The first task was to take before pics of five key areas of our homes. And then we kicked off. 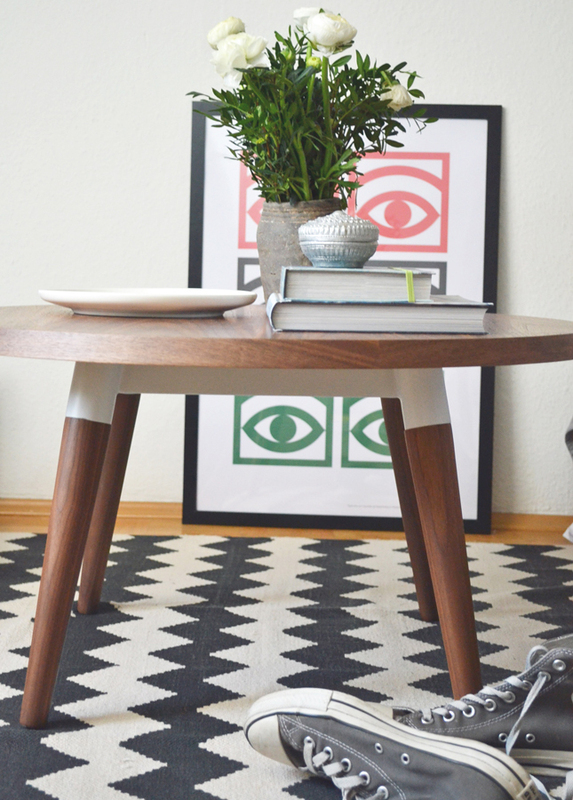 First stop: coffee table and sofa styling. Since my place is tiny and I have no extra storage room I tend to keep it rather sorted and uncluttered at home. Moreover, I’ve decided to work with what I’ve got at home. So no extra expenses. Rather some reshuffling and rearranging of accessories. So no too drastic changes. My living room has a rather muted colour scheme, grey, black, white with some pops of colours. My vintage kilim cushions set the tone and so I’ve interpreted the coffee table in a similar manner: I added a bunch of fresh white ranunculus in a textured, handmade stone vase, a small pile of similarly coloured books balanced the table setting topped by a bit of ‘bling’ – an old Moroccan silver box. The Marimekko plate ties the mixed ‘ethnic meets Scandi’ style together and reflects the rug’s rich pattern. Plus it comes in handy to drop little things and keep them in one spot. The sofa was slightly restyled. 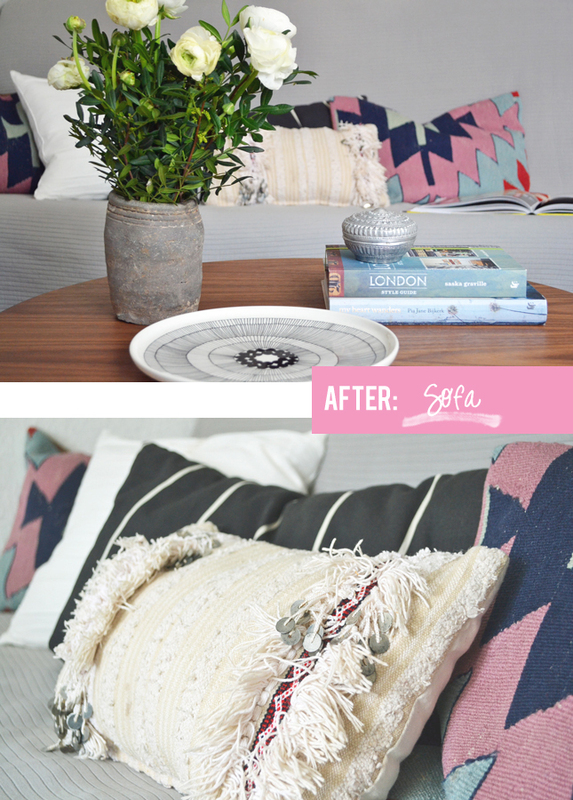 I swapped the grey cushion with a white one plus I added my vintage Handira cushion from Morocco which added a hint of bling. All this was finalized by adding a touch of liveliness – an open book on the sofa and a pair of Converse. Voilà! I must say I was rather happy with the outcome of my first round of restyling. I would really love to hear your opinion so make sure to share your view points in the comments. 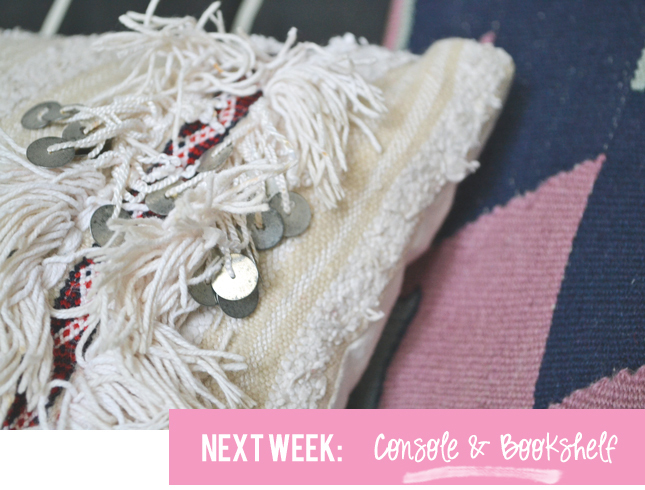 Next week I will continue with the second part – the styling of my console and bookshelf. The after looks are so much more lively! (but I love the business cards on the Marimekko plate before as well 😉 ). I’ve read so many enthusiastic tweets about Justina’s class! So nice: she’s so talented! What impresses me most is your tenacity as a student. No wonder you’re so great at languages, blogging etc. You sponge up information and give it the famous ‘Happy Igor’ twist. This here is no exception. Great work, I really like it! It looks styled but not overstyled, really well balanced. “Ethnic meets scandi” is right up my alley, too. And where is that coffee table from? It’so nice, and I’ve been looking for a table like that for a while already. Thank you Lena!!! 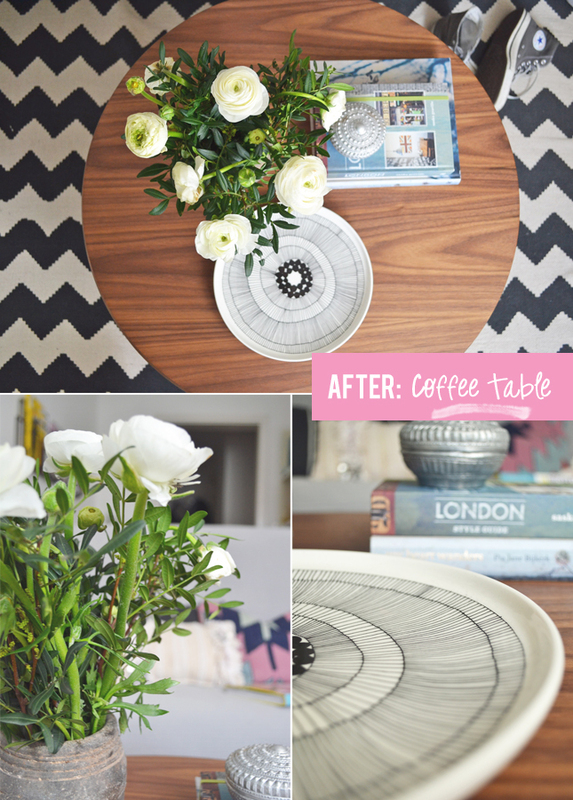 The coffee table is called ‘Copine’ and I got it from ‘Fashion for Home’. Thank you, Igor! I just had a look at it and might really get it, too. Or maybe another version it. My never ending coffeetable hunt seems to come to an end, finally! It looks good Igor, though I like the before coffee table just as much. 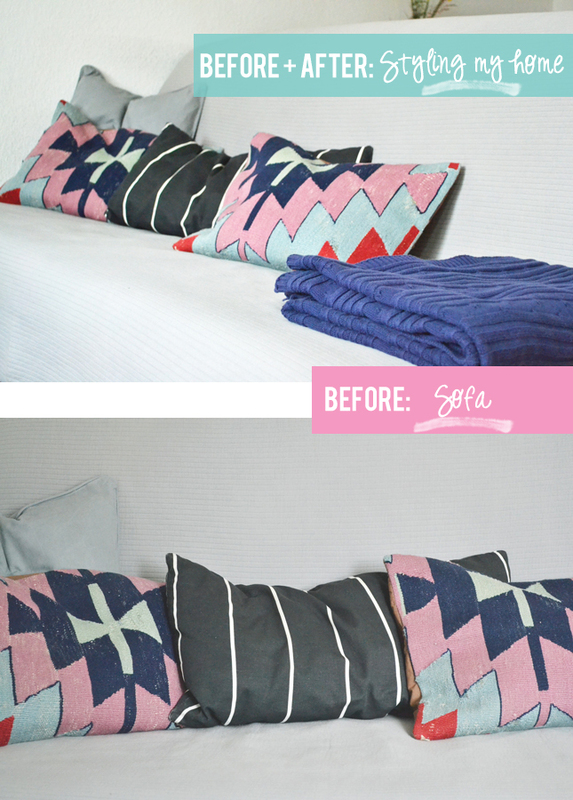 I know you love your cushions, so am glad you’re pleased with the results. OK… I’ll say it… did you really need to take a class to do what you’ve just done? Maybe you did feel you needed the extra input, but I would hazard a guess that you could have arrived at that look with your own know how and interiors eye? Who knows, maybe not, but I’ve learned some useful principles of styling that I’m applying more consciously now. So yes, the course was quite useful after all! Wow, I would love to take that class, too. Your alterations are simple but really make a change. Congratulations Igor! I don’t think you needed to take the class from what you’ve done, but it must be interesting to see the principles at work. You seem to live an uncluttered, in-the-present, happy lifestyle so could take the course on board easily. Thank you so much, this is wonderful description of my style! Merci mon amie!! On se reverra ce mois-là? Gold stars from me all around Igor–it was so, so lovely to have you in this class and I LOVE your space, your eye, and your sweet sensibility!! Big hugs and thanks for your kind words! Oh thank YOU my teacher:-) You are the best!!! I LOVED the course! Αυτο που μου αρεσει (φυσικά) στο after τραπεζάκι ειναι τα λουλούδια! The sofa definitely feels more lighter and I love the look on the coffee table. 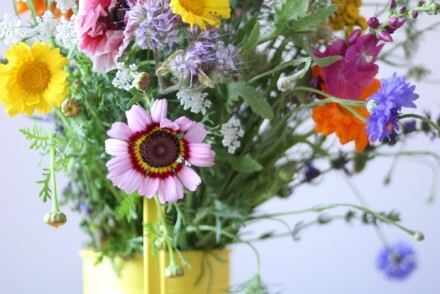 That vase… And yes, all this is very you. It has nothing to do with styling but I’m curious to know what you think of that London book. I have heard about it so I added it to my wish list but I have never browsed through it. It’s a beautifully photographed book full with great London tips, Lisa. Plus I love the haptic of the raw paper pages. Excellent point, Desiree! I haven’t paid attention at all to the poster because it’s always been there. Good to have an outsider’s eye on it! Oh and I will say hello to Ricarda tomorrow. We will dine together. Thanks for your nice words on my blog. 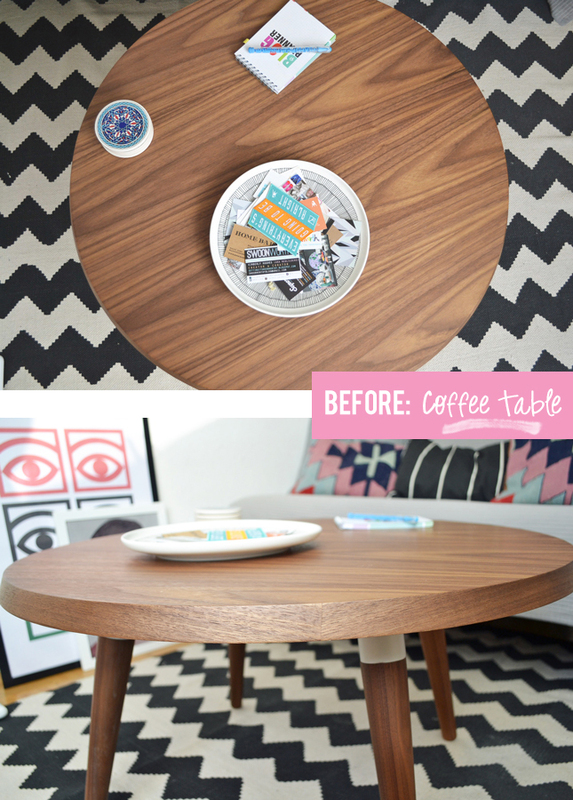 And i liked the before and the after as well:D The marimekko plate i love. I really like your restyling. It´s incredible what you can do with the things you already have, right? Moving things around can certainly do wonders… Looking forward to your next styling, Igor. I have to say that i really love your coffee table and its much better now! !